Blue membership is $50 per year or $70 for family membership. Show more support with an $80 Gold membership or $100 for family membership. Family memberships allow for one to submit for 4 instead of 2 tickets in the annual ticket auction. To pay your dues in an annually recurring "subscription payment" using your credit card or PayPal account, click the button below. For more information, see the Membership area. Don’t feel like getting involved, but still want to donate (a tax deductible donation), you can do so through our Better Unite Always on Campaign. Gender, birth year, and ethnicity are used to connect you to the Club’s the Young Alumni, Senior Alumni, ND Women Connect, and Diversity groups – for no other reason. #NDDay starts on Sunday, but voting has already opened! 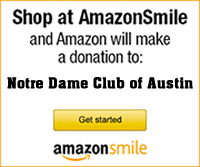 We need your support to help raise scholarship money for our current and future Notre.. Happy Earth Day! “We need to care for the earth so that it may continue, as God willed, to be a source of life for the entire human family.”..